The Glacier Q100 has been discontinued. No direct replacement is available. Portable data collection for the toughest environments. 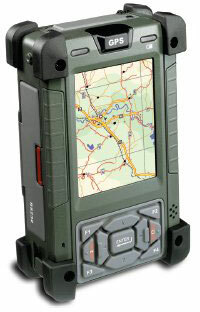 The Glacier-Computer Q100 rugged PDA represents a new standard for data collection in harsh environments. Designed and tested to an IP67 rating, the Q100 rugged PDA will withstand wet, dusty environments as well as extremes of temperature. Please call one of our sales representatives to help with your specific configuration. Bluetooth, Integrated GPS, Compact Flash Slot, Rugged Touchscreen. Please call one of our sales representatives to help with your specific configuration.